When I married my sweet, delicate and beautiful fiancée I feel like the happiest man in the world. I didn’t know that this fragile being snored like a lion. I couldn’t imagine that a little mouth that looked like a rosebud could produce such terrible sounds. I loved her deeply but without being able to sleep my marriage turned into a nightmare. 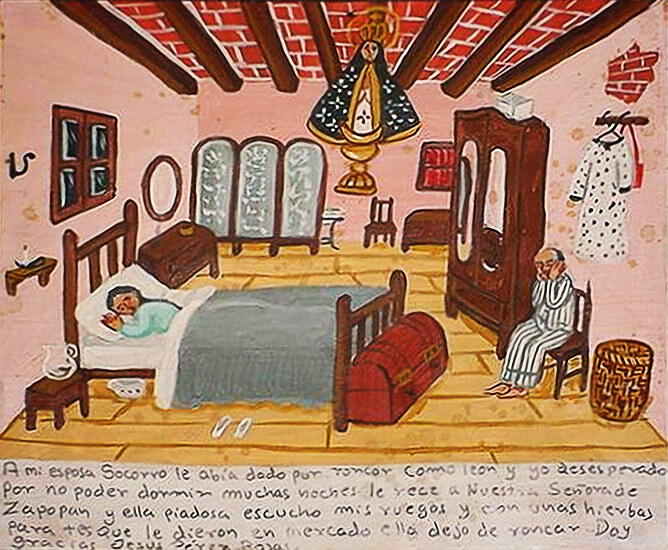 Then I implored the Virgin of Zapopan who, in her infinite mercy, worked a miracle, and my lovely wife stopped snoring. Now she just whistles but that doesn’t bother me. I give infinite thanks. 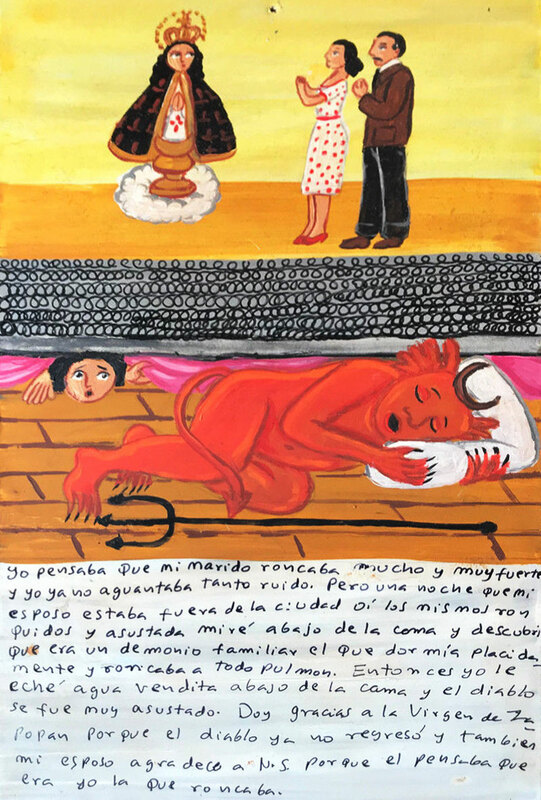 The Raquel Ramirez’ husband began to snore in a terrible manner. The poor woman couldn’t sleep for a whole week. Then she desperately prayed to the Virgin of the Rosary, and the merciful Virgin made the miracle. She made tea with the herbs prescribed by some nuns, and don Samuel stopped snorting eight days later. She thanks. One night, after so many years of happy marriage, my husband began to snore. And he snored like a lion ever since. I couldn’t sleep and fell tired all day long. My happiness and my marriage were at danger. 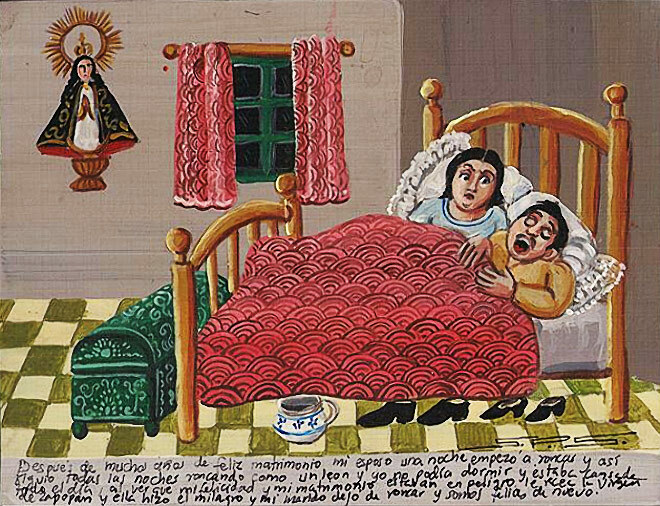 I prayed the Virgin of Zapopan, and she worked the miracle—my husband stopped snoring. Now we are happy again. I thought my husband snored a lot. I couldn’t stand this noise. But one day when my husband was away I heard the same snore. I looked under my bed in fear and found out it was a house demon who slept calmly and snored with all his might. I sprinkled some holy water under the bed, and the devil ran away frightened. 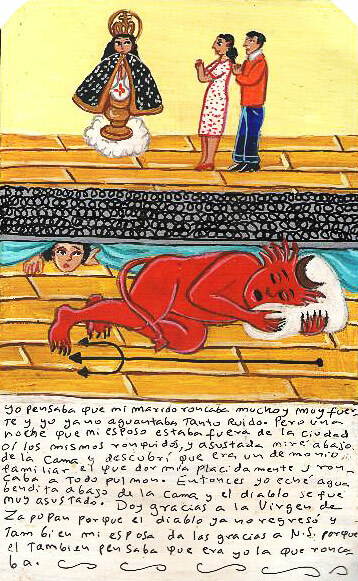 I thank the Virgin of Zapopan because the devil didn’t come back. My husband is also grateful to the Virgin because he thought that it was me who snored. 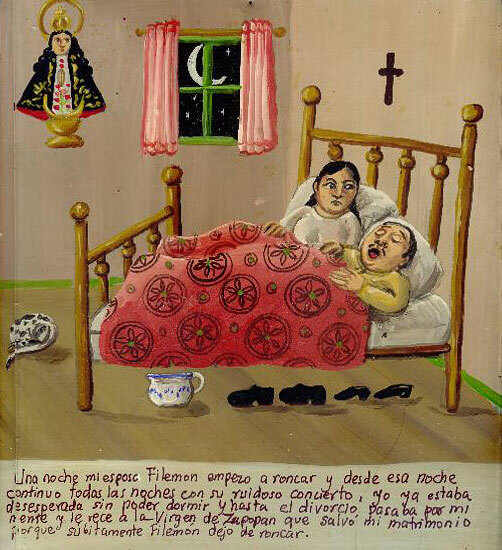 One night my husband Filemon began snoring, and he snored ever since. I couldn’t sleep because of his noisy concert, and I even started thinking about the divorce. 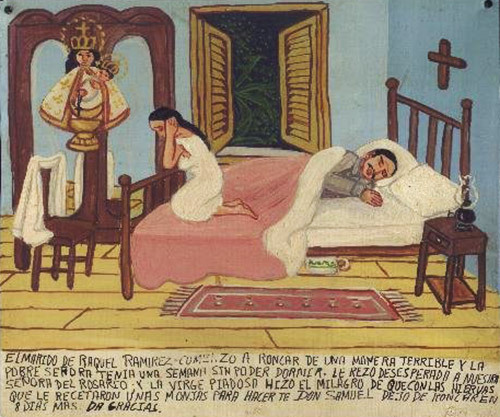 But then I prayed to the Virgin of Zapopan, who saved my marriage because suddenly Filemon stopped snoring. I married my beloved Chayito without knowing that she snores like a lion. Although I loved her, my marriage became a nightmare because I couldn’t sleep. 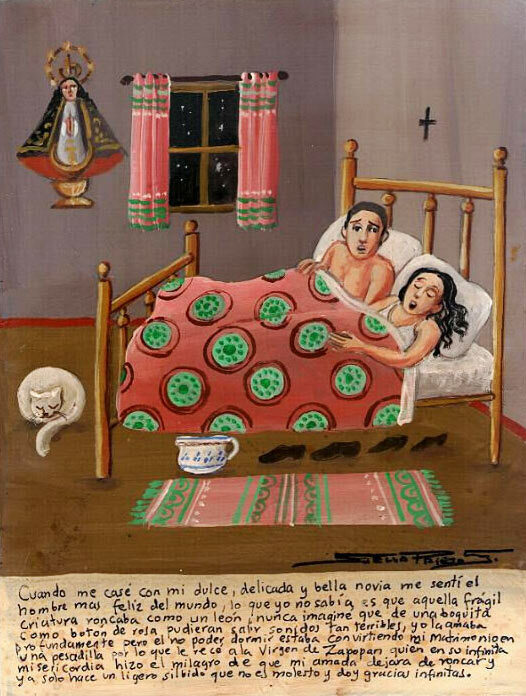 I prayed to the Virgin of Zapopan so she’d help me to resolve my dilemma. 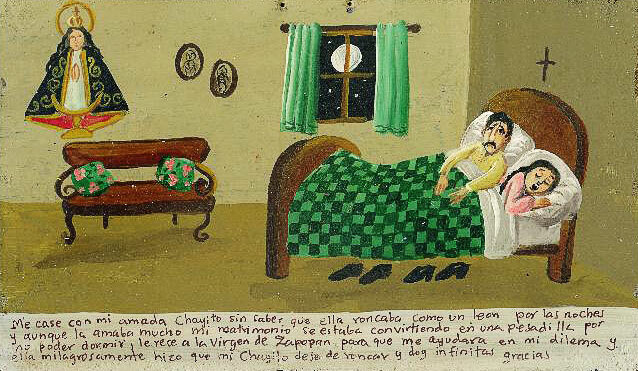 And the Virgin miraculously made so my Chayito stopped snoring. I thank for that. My wife started to snore and I had no sleep for a few nights. I prayed to the Virgin of Zapopan and she mercifully heard my prayers. My wife was given some herbs for tea in the market and after that she stopped snoring. I give thanks for that.